If you are interested in selling an old slot machine or Jukeboxe please contact us. 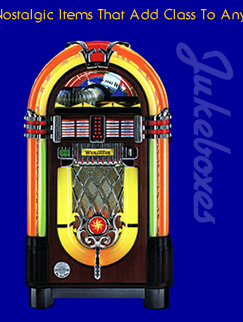 The Jukeboxes we offer are genuine Deutsche Wurlitzer. These machines are built with the highest level of quality. These classical styled unites boast a transistorized stereo amplifier, with automatic level control and electronic overload protection, produces 200 watts of music power. With the choice of either 45 rpm or CD play. We offer a full line of optional accessories like infrared volume control, bill acceptor, and wall speakers. Deutsche Wurlitzer are know for there quality music products worldwide. They have also painstakingly replicated a line of nostalgic soda machines. 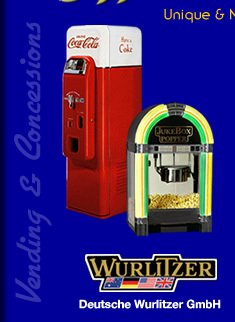 We also offer fantastic products like The Jukebox Popper, popcorn machine. This popper has the retro styling that will make a great addition to your home, lounge or business. 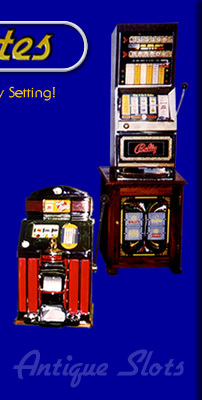 We buy and sell all models of old slot machines; Mills, Caille, Jennings, Pace, Fey, Watling, Rock-Ola or any others. All of the machines are restored using as many original parts as possible. All our parts are cleaned and refurbished to make each machine look exactly as it did coming out of the factory years ago. We are sure you will be satisfied with our machines and we guarantee them for one year. We have many more machines in stock that are not listed on this website.